Last week, I traveled to Circles Conference, a two-day event for creatives just outside of Dallas, Texas. This was the first conference I’ve been to on my own, in a state I’ve never been to before, and I didn’t know many attendees outside of some brief interaction on Twitter or at previous conferences. Did I mention several of the designers I’ve admired for years would be speaking or attending? To say I was nervous is an understatement. The conference ended up blowing me away. There was just the right amount of speakers that touched on all the right points to leave me inspired and ready to take on new projects. Each speaker’s talk was incredibly different, yet I think my initial hesitations about going to the conference led me to find one overarching theme among all the talks: don’t let fear get in the way of your work. Since fear is something that plagues everyone, I know my takeaway from the conference is something useful I can bring into my own process, to the team at NMC, and heck, any other industry that deals with some sort of creative process in their workflow. Several of the speakers brought up risks they took on large projects that they didn’t have much experience in. Design agency, The Heads of State, gave an example of a mural project they did for Nike and the Penn Relays. They’d never done a mural before, but said yes and designed it around work they did have experience in: screen printing, stenciling, and wheat pasting. Letterer Jessica Hische told a similar story when Wes Anderson approached her to create the film titles and credits for Moonrise Kingdom. She’d never created an entire typeface before, but took on the project anyways because she knew it was something she could not turn down. Lesson learned: Don’t be afraid to take a risk and take on a project you’ve never done before. Not only will you expand your skill set, but you may even open yourself up to bigger clients and a whole new type of work. A quote from Hillsong designer Jay Argaet stuck with me throughout the entire conference. He said: “Don’t start with your limitations because you’ll just be stuck inside a box.” I loved this quote because it’s easy to get caught up in things like budget, client restrictions, etc. when you are beginning a project, and this just ends up limiting your ideas. Designer Matt Lehman gave some similar examples when he was working for a large company and wasn’t getting to work on the type of projects he wanted. Rather than staying in the “box" his company had put him in, he did the projects anyways and ended up getting recognition from his company and similar projects afterwards. Lesson learned: Forget about thinking “outside of the box”. Drop the idea of the box altogether. Your ideas won’t be so limited, and it may lead to more projects that you’d prefer to work on. Don’t be afraid of first steps. This is a huge problem for me. Whether it’s a fairly small design decision or a grand new idea, I’m often afraid if I don’t make it perfect on the first try, I shouldn’t do it at all. Illustrator Becky Murphy’s entire talk was about taking those first steps on a project. She gave the example of a book she recently published. It was something she’d always wanted to do, but had no idea where to start. She ended up just setting a goal of creating illustrations for the book everyday and posting them online (even if they were terrible), and eventually she was able to work her way to the finished product. Lesson learned: Just get started on what it is you’d like to do. Yes, there are going to be times where your work won’t be perfect, and times when you’ll fail. But you won’t be able to grow or achieve your goal otherwise! As designers it’s pretty easy to feel that if we’re not busy, we’re not growing. In reality, that’s how you lead to a burn out. Matt Lehman gave a great example of how he ended up working on a project through an entire vacation. It led to strife with his family, he was exhausted, and in the end the client scrapped the project. One Fast Buffalo founder, Ben Jenkins, put it perfectly during a panel when he said he completely takes off when he decides to go on vacation, but when he returns, he comes back filled with more ideas than he ever would have if he had just kept working. Lesson learned: Don’t be afraid to give yourself a break. Not only does your body need refreshed, it’s an important step in creating new ideas. Imagine your ideal day, what it would look like if you had absolutely no fears. Get specific about what your fears are, and identify the worst case scenario for yourself. Maybe it’s bombing while you’re speaking at a conference, losing a client, not having enough money, being terrible at a new skill set, or just plain failure. Make a mantra that helps you ignore your fears and puts you in a new mindset. Kathleen gave the example of how people were asking about her work and she would always say “crazy busy!”, and therefore felt busy and out of control. To get back in control and feel calmer and better about her business, she simply started telling people that she was “wildly productive and living the dream”. Along with Kathleen’s big picture ideas to get rid of your fears, many of the speakers gave some short-term ideas. One that stuck with me was Jessica Hische’s idea to not look at similar projects before getting started on your work (something I’m guilty of with all my NMC work!). That will end up paralyzing you and you’ll feel like your work will never be as good. Lesson learned: Figure out what your fears are and get started right away on quashing them. They are only holding you back from your work! I left Circles feeling refreshed, inspired, and with tons of new friends and great conversations with designers I would have never had otherwise if I hadn’t put my fears aside from the beginning. I’m excited to take the things I learned and apply them to my work, hopefully becoming a little less fearful of trying new ideas and taking risks at NMC. 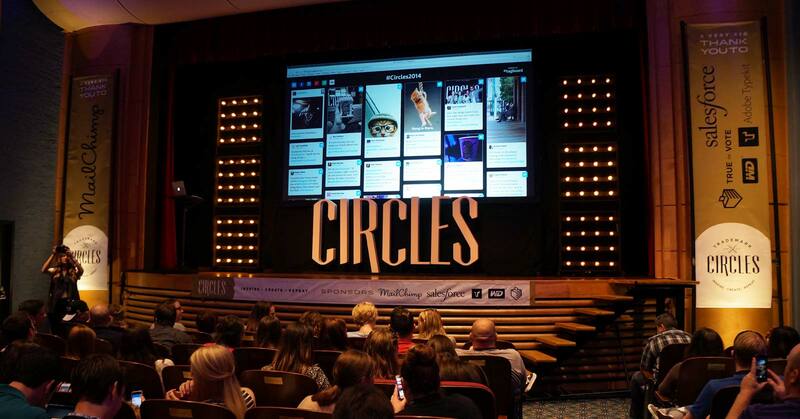 Did you also attend Circles this year? What was your takeaway? I’d love to hear it!